Our prize for beating Madrid in the Copa is a semifinal against Valencia with an injury depleted squad. Liveblog starts a couple minutes before the 3:00 PM EST kickoff. Not thrilled about seeing Cesc in the lineup today. He looked like he was running through quicksand on Saturday, but at least Thiago is in there for Xavi. I’m a little worried about Puyol for the same reason. Calvin Dear, the offside twitter has a different starting XI. Dunno which one is right. Barça starting XI: Pinto, Puyol, Piqué, Mascherano, Abidal, Busquets, Thiago, Cesc, Alexis, Messi and Cuenca. Thanks. I’ve been relying on the official FCBarcelona site, but its been wrong twice so apparently I shouldn’t do that anymore. Yes, 4 at the back. That is all. NIce to see Busquets in the line-up. We cannot afford to miss him in this match. Very sad news coming from Egypt..
Horrible. 73 last I saw. OMgosh that’s awful. Morbo gone mad. It’s only a game. Abi seems so well-loved by the Valencia players. Mmm…dont know what to feel about this draw but i guess it’s better than losing. messi was pretty bad today. i knew he was going to hit that penalty in the bottom right and it would be saved. I think Cesc should take the next penalty. And Messi be rested against RSSD. Also, I want to see more of Tello, really like his explosiveness! Strongly disagree. The best player in the world should simply improve his penalties. Agree that he should be rested, though. This is obvious to see. Really afraid that Pep is going to burn out the whole squad before the business end of the season. Considerung a possible penalty shoot-out, it’s better to have different penalty takers during a season. Messi and Cesc could share, and even some other players like Sanchez or Iniesta. Plus, Cesc was the #1 penalty taker at Arsenal, if I’m not mistaken. It’s good to have a Crynaldo in your team who scores 95% or maybe 98% of all penalties, but it will only be one out of five in a shoot-out. I’d rather have more players used to taking penalties. And obvisouly Messi is tired right now, he’s losing disproportionately often possession, his ball control is far from that ‘playstation-like’ close control that Wenger admired. Messis penalty-record this season is quite bad… 50:50? It was interesting in Emery’s press conference that he talked about how much trouble Messi causes them. Something about how they’d like to go forward but you have to watch “that little number 10” or something. Bad or not, the threat of Messi neutralizes resources. This figures in the constant presence, but when he’s out there he has to play, and the fatigue piles up. So do you put a tired Messi out there to be surrounded by 4 people staying deep to create space for others, or rest him and go 11v11? O.O I was just coming here to make this point without having watched emery’s presser. For me I can only imagine what a boost it would be for the opposition to see his name off the team sheet or to see him walking off at 60 minutes with the score in the balance. “All right lads, lets have a go !The freak is off!”. I’m talking about against good teams because obviously it shouldn’t matter what small teams think of our line-up, but his presence is something that helps keep the top teams uncertain, even if he’s having a stinker. That’s very much true – Alexis was obviously in not a very good condition and Cuenca was running into walls any time he got the ball. Xavi and Iniesta are not there to at least maintain possession and create chances through passing. So if you rest Messi, the only real threat left is gone and it’s a different game. Apparently we just didn’t play that well? I’ll be happy with a draw. Dont know how we could’t score in the 2nd half. So many attempts and got so close with that Alvez shot. and Puyol – RESPECT!! what a game!! The match was fine. We missed chances, and Valencia played a very physical match that emphasized tactical fouling, particularly in the midfield, as a way to disrupt play. Messi was selfish, Sanchez was in 98% mode and somehow, Alves hit the post. It happens. This team is no longer going to blow teams away. Not with the injuries and fatigue, not to mention an erratic Messi. A 1-1 at their house is a good result. The burden of expectations can be a brutal one. Personally, I don’t think that Messi should be allowed to take penalties because he isn’t all that good at them. The best player in the world isn’t necessarily the best PK taker in the world. Players have tendencies, keepers study those tendencies and make guesses based on the situation. A different player throws all that stuff out of the window. P.S. My nickname for Sanchez is 98%, because he often does 98 percent of it right, and then …. Messi created the top opporttunities from Dani Alves and 98%, and played some other nice passes. For me he lacked some accuracy and ball control, but I don’t remember a situation where he was close to goal and acting selfish, i.e. not passing to a better positioned teammate. He tried a lot of unsuccesful dribblings in midfield, but usually he wins more of them and plays a deadly pass at the end of such a run. Then we don’t call him selfish, either. With less bad luck / better finishing, Messi would have had 4 assists today (Puyol’s goal was from his corner, Alves and 98% chances and a chance for Piqué, after a corner which Messi headed back to Pique – a goal which Puyol would have scored in 9 out of 10 cases). Happened at least twice that I can recall seeing, including one where 98% would have been on and clear. For me, performance isn’t a trend, it’s a game-by-game situation. And today, Messi, for me, was selfish. I leave the broader stuff to others but today, just because he made passes doesn’t mean that he wasn’t selfish. He always makes passes. But for me, today, he ignored runners at crucial times. I’d go back and pinpoint those times, but just having moved, I am TV/DVR-less. Yup – there were at least 2 occasions last night where I saw free and better-positioned Barca players in front of goal and Messi didn’t pass – both on his breakaways, I think. Sanchez was absolutely clear on one occasion. I was yelling (at the TV!) for him to pass, so there were free players around him that I could see. His freekick was abysmal. I believe that there was a set move happening there, as the Barca players drew the Valencia defence way out to the right. I’m not sure if that was a ploy to allow Messi a clearer path to the goal, or whether he was supposed to kick the ball over to the Barca players, but either way it failed. As for his penalty kick. With Alves already moving over before he struck the ball, Messi still couldn’t kick the ball into the other side of the net. Height and direction all wrong. Yikes. Felt like some of the perceived selfishness, assuming we’re talking about those few times where he looked like he forced the situation when he may have had a pass, looked like frustration… Maybe with the muggings, or the penalty, he looked like he really felt he let the team down, maybe trying to set things right for not having put it away. Little old fashioned pressing, and trying too hard maybe. with fatigue and injuries, 1-1 is an okay result, and expected by me. it’s Valencia at Mestalla anyway, I believe Guardiola only won here once, when he had a problem with his back? poor Cesc, that’s what you get when you have a best friend like Gerard Pique, your head will bleeding sometimes. I love them…but seriously– is it really necessary to do the V sign in every picture? 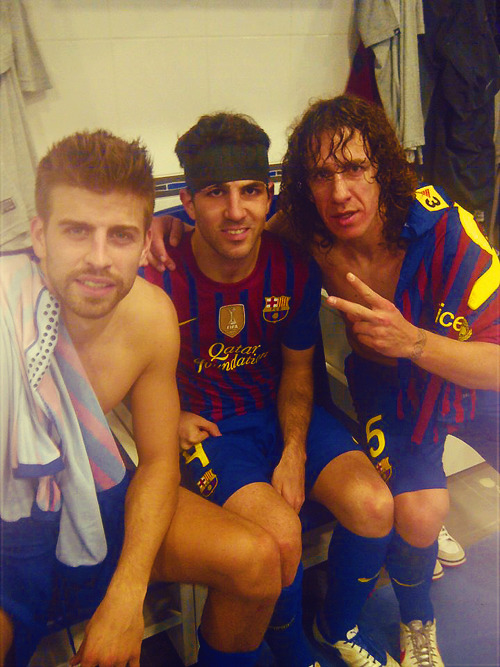 😆 Cesc looks like a little abandoned kid picked up by Pique & Puyol. I’ve been thinking about that hand signal, kinukinu. It’s only appeared this season. I do believe that it’s some message, and I’ve read it to mean that they’re going for 2 Champions Leagues in a row. Mmmm…Agree with most of what you are saying but I don’t agree that Messi should not be allowed to take the penalties. He was fine until this year when goal keepers started to figure him out. Both today and against Sevilla the keeper dove left to save the penalty, where I think I recall 70% of Messi’s penalties are aimed. Messi should simply buck the trend and start shooting to his (messi’s) left. Cesc might be a better penalty taker but one also has to consider the hierarchy in the team. Messi is the best player on his team and in the world and while obviously that doesn’t make him the best penalty taker, it does earn him the right to take the penalties. Unless he keeps missing them this season, of course. Pardon me? Please check your attributions, as I have neither seen the game nor commented in this thread. Leo usually looks to send the keeper the wrong way, by making a last second decision to commit to a particular direction. But he needs his usual supreme confidence and composure. Against sevilla and again tonight, he chose to be safe instead. Let him figure the problem out. Surely the best player would come up with the best of solution. The problem was that Diego Alves was inching to the right the longer Messi waited – by the time Messi shot, Alves barely had to dive. When Messi takes them high and to the right they’re pretty much unstoppable, but the medium height ones are just horrid. Agreed. Like u said, keeper was already inching to his left before the shot and if Leo had intended to hit a less powerful, medium height shot, then the safer thing to do was to aim for keepers right. As then it would force a brilliant save due to his initial position. And even if the ball hit the post, it was more likely to deflect into goal, due to more curl coupled with low velocity. I think Leo tried to re-bluff the keeper. Anyways, shouldn’t be too harsh on PKs. Its not easy on anybody! Thiago did well though, to win one. Yup. The medium ones are the worst. The ones that are medium height are easier to stop by the GK. It’s either low corner or top corner. I always choose mine low corner. Or maybe once in 50 or something. Please get some rest. Take a lego break. Make someone tie you to the bench. Spend some time with that sweet girlfriend of yours. Have a spa day. Whatever you need to do to get your form back (besides playing 90 minutes EVERY game), we support you. What the hell are wrong with those Egyptians (sorry Diego)??!! They won the match and yet they want to act like barbarians!! Instead of celebrating they want to kills people. Animals! Hopefully Diego wasn’t at the match or an Al-Ahly supporter. Football has unfortunately been subject to recurrent acts of violence, including those amongst supporters. It’s hardly only an issue that developed today or located in Egypt. What happened in Port Said is sad and awful. But there’s too much violence associated with football in too many places around the world. Given the line-up Pep fielded at a very intense stadium like the mestalla, we actually returned with a positive result. Our performance was not that bad, we’ve had worse performances against Valencia with a much more illustrious line-up. On the other hand, it was another game of missed oppurtunities. Am I the only one who feels whenever Messi has a beard, he doesn’t play well? or might I say, whenever he has played badly he has had a beard..hmmm.. I have never been a fan of messi’s penalty taking style. it just does not transmit confidence to me, the way he nonchalantly walks up to the ball and tries to place it. He should share the penalties with whoever is feeling it at the moment, whether it be Villa or Cesc or Xavi or Thiago. It cannot be just messi by default, its a screwed up system just designed to make him compete with Penaldo. we dont need to do that. I am sure villa, cesc or thiago even will have a better conversion rate. also i dont think i have seen messi so off form.. worrying stuff.. He could have passed the ball in so many promising opportunities yesterday. He cannot go running all on his own especially when he himself knows that he is off form. the last corner miss from him was shocking. c’mon boys, pick it up, we need this last lap. not to mention the elegant giant who seems to be a love struck brooding super model who’s head seems to be around shakira when he’s on the field. Yesterday Puyol was schooling everyone – teaching mascha and pique how to defend and teaching messi and alves how to attack. I actually thought that Pique had a much better game last night. Apart from the header that he missed. 1. Our players are not 100% committed to tackling the ball carrier to get the ball back. They’ll crowd around the player, but no one is committing to get in there to try and get the ball. Even worse, as they crowd around the ball carrier, they leave other opposition players in space to accept the ball. 2. It’s not unusual that Barca starts play from the back – that’s part of their style to build a movement from the goalkeeper. But when an opposition team is pressing like hell, that’s not the time to be playing tika taka down the back between 3 Barca players when you’re surrounded by 4-5 opposition players. Sometimes there’s just 1-2 too many balls played backwards when they should be looking to play forwards and get some movement happening. All they’re doing is allowing the opposition to reposition their defence and send out their advance guard to get the ball off Barca earlier. Our midfield doesn’t work in these situations because our midfield is having to retreat really deep to help the backs who are having issues with clearing the ball out. This then leaves a big gap between the midfield and the forwards into which the opposition players place themselves and win back the ball. To shed a light on the recent events in Egypt. Al-Ahly (most trophies won in Egypt and Africa) was playing el Masry (A Mid-Table team), The match was at el Masry’s stadium in Port Said. This match always have been a tricky fixture for the top two teams. These events are pre-planned, We’ve played football since ever, and this fixture is played every year with Al Masry losing or drawing, Imagine their happiness when they defeat Al-Ahly, not 1-0 but convincingly 3-1 ! No reason at all for these events. I won’t deny that there were some people who weren’t “hired” and still came down to the field, Human and Egyptian Nature. But if you look at the video ..
That number and amount of people coming down at the same time running after and attacking Al-Ahly players and supporters shows that it wasn’t spontaneous or an individual act. Now Whole Egypt is mourning with no one to blame. Port Said Governer and Head of Security resigned. Al Masry President, Staff and Coaching team resigned. 2 Al Ahly players retired. League is suspended for undetermined time. All Egyptian Clubs suspended their sporting activities. Thought of you when I heard about this. Glad you’re o.k. I’m sorry to hear about the tragedy in Egypt. It is human nature — or I might say “nurture” — to sometimes hurt and be hurt, Diego; it’s not an “Egyptian” thing. Egyptians everywhere won my heart when they ordered me a pizza from my local pie joint to protest my ridiculous but duly-elected governor. So compassion and wishes for peace, for all. Ultras are just violent people who get to carry out their thuggery under the guise of being football fans. yes, it’s very difficult to believe it being spontaneous. – We produced some good goal scoring opportunities but the execution was not clinical. Two chances for Alexis, woodwork denying Alves, Abidal shot was blocked and off-target header from Pique. Not so bad of game considering the injury list, quality of Valencia and no Xaviniesta in midfield. But yeah, those missing chances were visibly one of symptoms of fatigue team. – Pinto clearly touched the ball outside the box with his “sloppy” decision. We’re fortunate referee didn’t see it. That could affect the final score significantly. – Puyol goal from set play always appear like he look unmark by opposing defender, hiding somewhere a bit far then rapidly flying from nowhere to head the ball. They surely train this set a lot. – Why Pep was so emotional in celebrating Puyol goal? Looked like he pissed off with something. Anyone knows? sorry Blitzen, I confused you with Helge yesterday! Messi is not the best penalty taker as has been mentioned above. He simply isn’t. I’ve never seen him just charge up and hit the damn ball in a good spot. He ALWAYS stutters up to the ball hoping to see what the GK will do first. This doesn’t always work. Sure Alves was well off his line by the time Messi kicked but still you could see it coming. Very poor showing from Messi who looked tired out there. We can’t expect him to be ridiculous every single game and unfortunately this was one of the games where he wasn’t anywhere close to his best. Rather selfish too. I counted at least 4 chances where Alexis should have been passed the ball, one would have been a tap-in. Cuenca had a decent game, showed good ball skill on several occasions but the kid needs to bulk up a bit. Miguel and the likes were throwing him off with such ease. ABSOLUTELY LOVED Pep’s celebration. That’s what we need to see. My fav Pep goal celebration, other than the infamous run down the sideline. Loved the emotion. Anyone know what he was saying? And a note on Valencia. What a team, eh? They are fun to watch. We must remember this is a team that lost their BEST three players in the last few year in Silva, Villa, and Mata. Yet they continue to play great football under Emery. All very skilled on the ball and have a very quick directness about their play. Doesn’t hurt having a striker the likes of Soldado up front either. i have a problem with how Goal.com rates Busquets every day! i always complain but it seems its of no avail! i say this year he’s good for at least 2 more(if not more)! For those of you who are interested, the Barca Women are about to start a match against Japan’s INAC Kobe with Women’s Footballer of the Year – Homare Sawa – playing as #8. Nice! I just saw a replay of the INAC Kobe goal. Good stuff. I need a scouting report. Are there any hot chicks on the Barcelona team? The game’s actually quite good. Kobe’s goal was a lovely chip, but the player brought the ball down using her upper arm. Should have been disallowed. Barca’s goal was beautiful. I was kidding… although I do feel like it’s my turn to do the objectifying. And I would not call Barcelona/Olga’s goal “beautiful.” Lucky to get it before the break. They’ve been getting their asses kicked. They have gotten to a good start to the second half, though. It’s our turn now. Fanboys unite! Tons of forwards. Maybe Pep can call up a few to help us out in the short term. They surely can’t be any weaker than Cuenca, or as injury prone as Pedro.